Those of you who have hung around here for any length of time know that I love quilts with super-imposed images. I love when your eye sees a quilt one way, and then there's a 'shift' and boom! You see that same quilt in a different way, the first image receding, then there it is again, and so on. It's like Rubin's Vase. 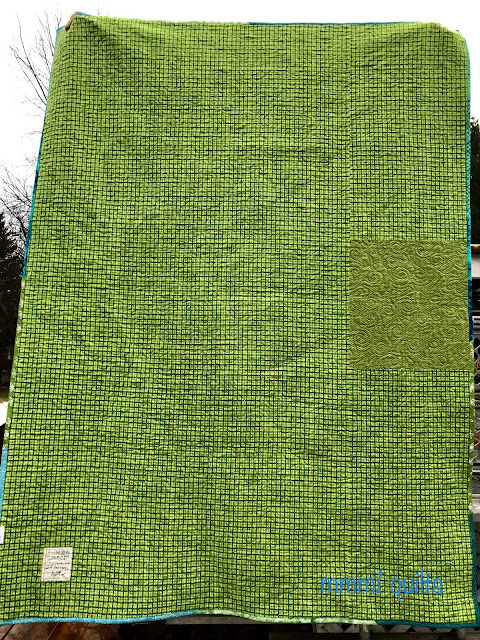 'Float', which is what I've named my Splash of Colour quilt, has a similar illusion effect. 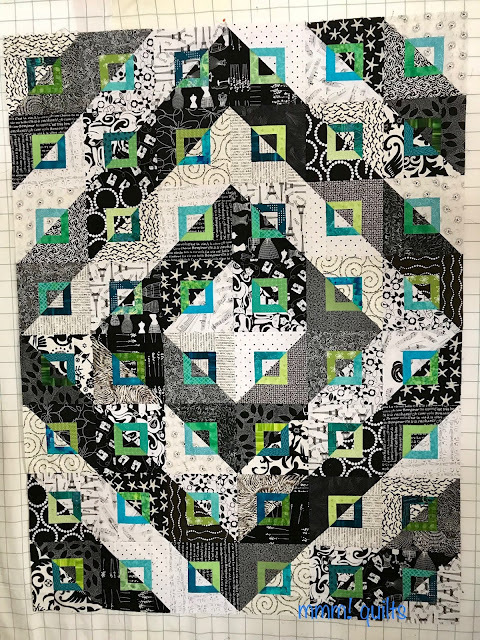 All right, a quick recap: this pattern, by Sandi Irish is in a magazine I picked up in a package of older ones at the Sarasota Quilt Guild's show a couple of years ago. It's McCall's Quick Quilts, June/July 2012. You can purchase the pattern from Sandi's website here. 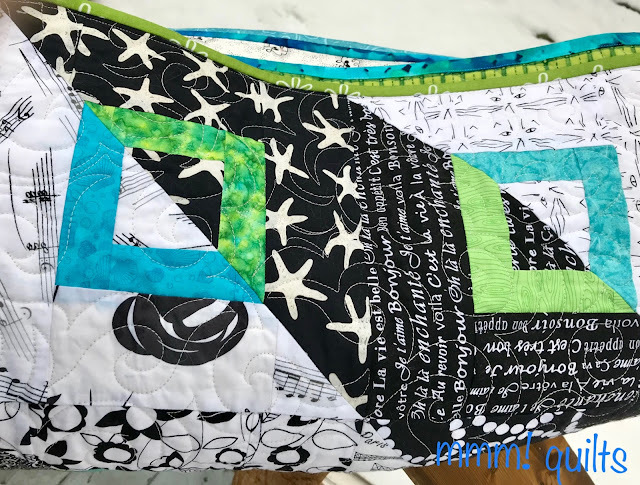 You can read two posts about the quilt top, the first half on the design wall here, and the finished flimsy at the bottom of the post here. Here is the flimsy which I did finish by the end of 2017, but posted on Jan. 1. This is a pattern where I actually folded the magazine open to its picture because I loved it so much. It has sat beside my sewing machine on the two-tiered rolling toolbox since we got back from Florida at the beginning of April. I so wanted to make this quilt, and didn't want to forget about it! Many other events happened between it and the dawn of Myra's Splash of Colour QAL. When I saw that, I knew instantly that I was going to join in, and what pattern I was going to do. After all, I had collected black and white, and white and black fabrics for a little over two years, and it was TIME. 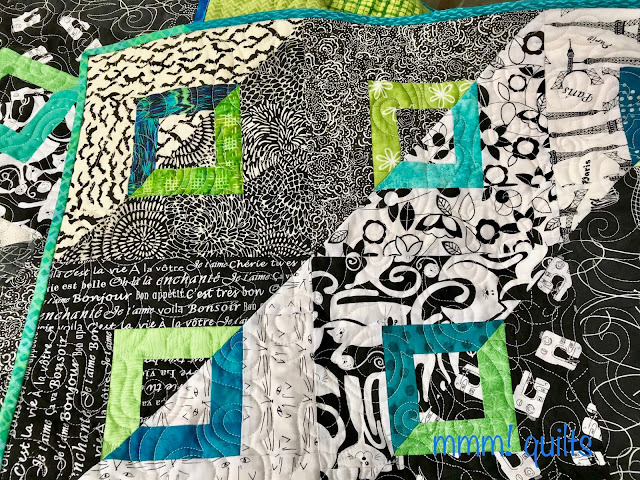 When it came to quilting it, I toyed with the idea of doing ribbon candy in the turquoise and lime squares, but then soon realized that would be a tad fussy, possibly involved changing threads, working into the centres to do a little meander, then back out again...I needed fast. There are a few commitments and deadlines looming. Besides the fabrics and design is what needs to sing on this quilt! Part of the photo shoot was actually IN the rain...and wind, sigh. It flipped over a corner, but I didn't retake the photo because it shows how well the backing goes with the front! I have long loved Angela Walters' swirl and hook design, and still didn't feel totally comfortable with it; some of the hooks looked more like a beak, some like a wing of hair that sticks up from having slept on it funny, others drooped like a wet flag...well it wasn't that bad, but you get the picture. Since this quilt was going to be mine, all mine, why not do an all-over swirl and hook meander to practise this motif? So I did. I think I have it down pat now. I used flannel on the back! The fabric is also from Connecting Threads, (affiliate link) a steal of a deal in their clearance section a little while back, and I bought all they had left, which, as you can see in the photo above, was not quite enough for this quilt. It is thick and fuzzy and washed up nicely. I may have smiled and said, yesss! when I took it out of the dryer to finish air-drying. 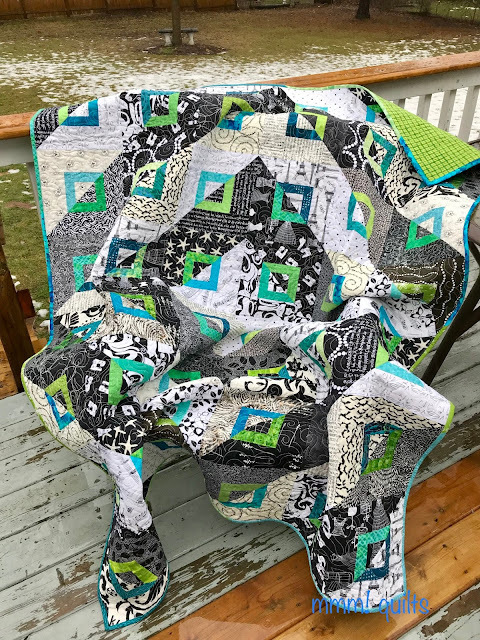 I always pre-shrink flannel when I use it as a backing; learned that the hard way... but I still love and use that first flannel-backed quilt, as does Brady his baby quilt which is still on his bed today, along with others. Love that child and his love of my quilts. Anyhow, when I was looking through the shelf of yardage for potential backings, and spied this, I may have actually said aloud, 'Oh yes!' Then, after realizing there wasn't quite enough, and feeling a bit disappointed, I was super happy to look through my flannel leftovers plastic drawer and find a fat quarter of the other green that matches so well. So, binding. I nearly did a solid black. This is why I never, well, except for Wayward Transparency, cut my bindings ahead of time. Like the quilting motif/design, quilts 'talk' to me about bindings too. It's important to get it right. 'Float' said, "Whaddaya think about multi-coloured?" Oh yes! I said (seem to be saying that a lot with this quilt...) So I chose three greens and three turquoises that were used in the quilt. I am so happy with the effect! The binding 'meh': I sewed the binding to the front of the quilt, turning it over to the back, intending to hand-stitch, as you read, but then needing to be faster. I was going to stitch in the ditch from the front, as I prefer to do when I machine-stitch a binding down, catching (and missing in usually more than one or two spots) the back. I don't like that the back looks like a drunk person stitched it down, sometimes the stitching lying nicely along the folded edge, other times, being too far in and leaving a bit of a lip at the edge. So I thought I'd glue it down (still can't get over that I do this now, and love it; you can teach an older dog new tricks!) and try stitching from the back so that the edge is nice and neat as you see above, and I was guaranteed not to stitch like a drunkard ha. It irritated me that there would be a line of stitching on the front of the quilt though, and what colour to use in the bobbin to try to blend with black and with white? I opted for Aurifil 2600. The line is still a little bothersome, but, like the crossed-over quilting in a couple of spots (that I haven't been able to find again huh!) I figure it will sink in with the first wash. It already isn't irritating me as badly as I thought it would, when my nose was 8" away from it as I stitched. Here is the rolled up shot trying to get as many of the six binding fabrics together. Overnight, the little snow we had left in the yard has gone except for patches here and there. The bad news? The temperature is dropping throughout the day so it will be freezing rain. I'd rather have the snow thank you. I also love that a few 'vintage' fabrics play so nicely with newer ones. Again in the photo above, the ocean-themed turquoise looks awesome against the lime green (so old I can't even recall the name of this fabric, but it is much like a batik, but it isn't, kind of fuzzed-out marbled. One of the turquoises, the water-themed one you see at the bottom of the above photo, in the binding is an old one, and goes perfect with the brand new Masterpiece Mixers by Kanvas. Below there's an wonderful old, no a vintage zebra print that I got thinking it might work as a background or blender in kaleidoscopes, but have never used. It's nearly all gone now. The turquoise inside it is a Nancy Crow ombré from early 2000s. There's some from my nephew Callum's quilt: 'Cleta', and bike tracks prints. There is a bit of the coolest white and black Christmas print, (look for the reindeer head and torso) that is the lining from Dayna's stocking, more meaningful turquoises and greens, new and old. And below you see another Nancy Crow water (fabulous!) 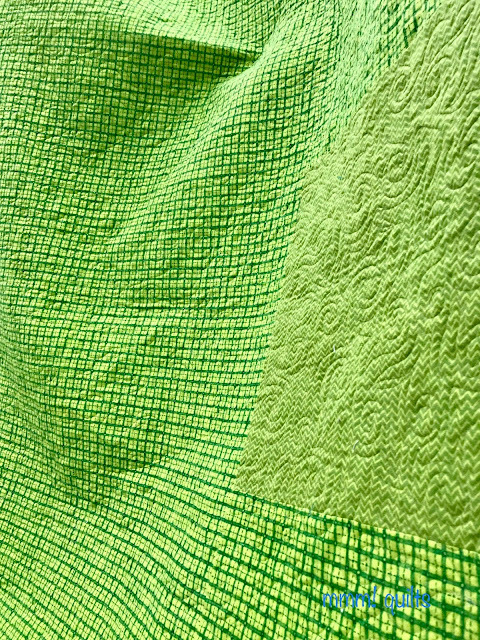 print beside a lime batik from The City Quilter in NYC, which itself rests on a fabulous batik used in Brianne and Tim's wedding quilt. There's even a bit of Brady's Halloween quilt, the bats print, Paris, cats, sewing machines, all add to the 'mmm!' feel I have when I look at this quilt. And finally, another....sigh.....menopausal moment. I pulled the quilt out after the last stitch was sewn down on the binding. Thought to take one more look at the magazine photo to see how closely this resembled it... Wait. WTF.... No.... Yes. Big breath. There must be a reason why my mind did not remembe,r nor think to read the pattern again once the blocks were being made and the flimsy was coming together on the design wall... I could say that 'this is a more modern look, no borders', similar to Angela with her tongue in cheek descriptions of the quilting motifs she does on certain quilts, "Well," in a snooty voice, "the reason I did swirls was to soften the effect of all the straight lines piecing, juxtaposing the angles with the curves..." . Eye roll. Nope, I messed up. Period. But I'm okay with it and I love the quilt as is. Took it downstairs and fluffed it out on my bed. Ahhh. Besides.... Preeti voiced what I'd already thought a while back, "Wouldn't this look great with pinks and oranges floating on the blacks and whites?" I do have a fair amount of blacks and whites left... and thus, the scraps continue to reproduce! 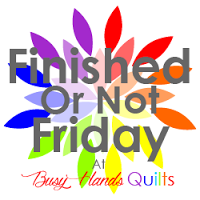 I am linking up with Myra at Busy Hands Quilts for the Splash of Colour parade of finishes! 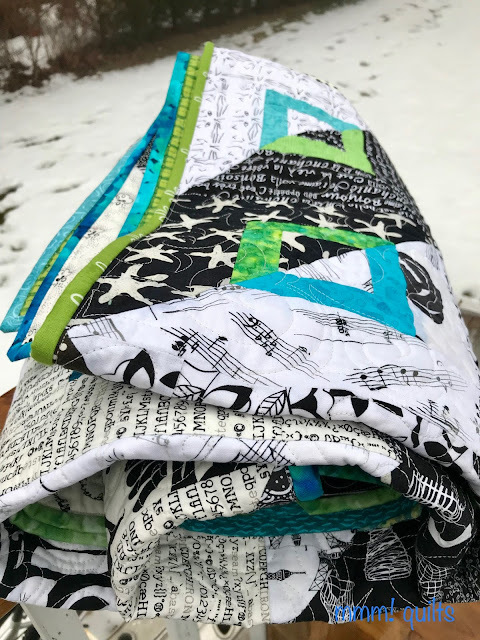 Check out that link for some lovely quilts. This is also a quilt on my Q1FAL List which is here. Size: pre-quilting 54.5 X 72.5"; after quilting: 53 3/4 X 71.5"
I think the quilt is perfect just the way you finished it, Sandra. Quilt patterns are all written by designers knowing that the quilter will make changes as needed to make the design work for them. I like it without the borders, and just think, maybe the flannel wouldn't have worked for the backing had you added them! Lovely colours, memories of each fabric, a pieced binding, and what a photo shoot outdoors and inside. This is yours!!! I have loved watching this one. I've loved it from the beginning, but I just wasn't sure why. You made that click with this statement, "... 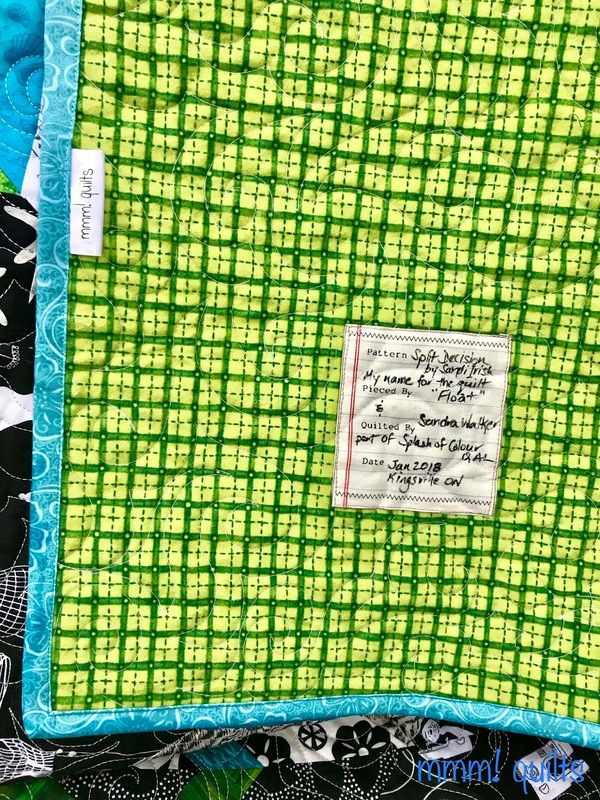 I love when your eye sees a quilt one way, and then there's a 'shift' and boom!" Yep. I love the way the blue/green squares fight... no... DANCE with the bigger back/white ones. They take turns being the foreground and the background... neither more important than the other, but neither as important without the other. Yes... this one does "speak." Ahhh! I love it without the border. Love the green against the black. Light Grey, Stone and Beige are all good choices for quilting when there are such sharp contrasts in the quilt. Stitching black binding using black thread can do a real number on your eyes. Ask me how I know. Salutations to the Goddess (Eyes)!!! Love it! I don't think the borders are necessary as it looks great without them. Congrats on the finish I think it looks great just like it is! I think it looks great! 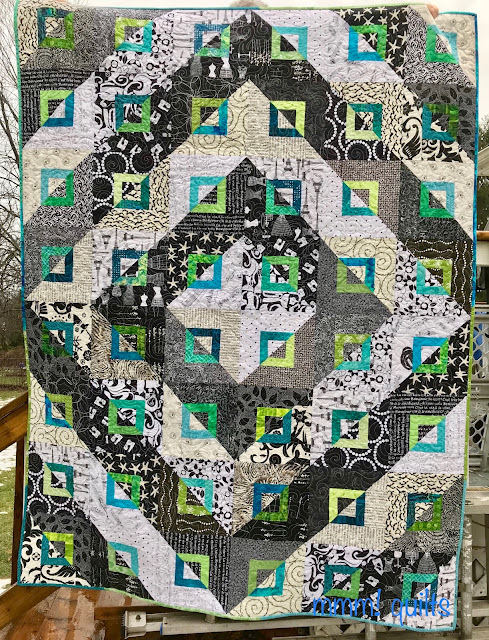 I just realized that the quilt I posted for Throwback Thursday was supposed to have borders, and I have no idea why I didn't put them on. Anyway, I like the blend of black/white and the greens and blues. Such a pretty quilt! I haven't tried the glue baste for binding yet; I usually hand bind, it's something I can do while I watch a show. Great finish, Sandra! Fab, Fab, Fab! 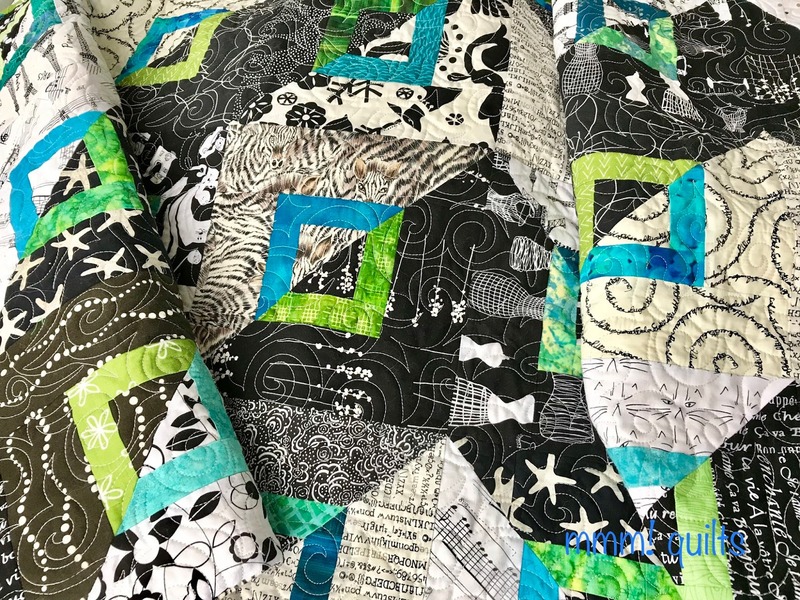 The aqua and green is an unexpected joy with the black & white fabrics. I am tickled for you and keep peeking at the picture of your quilt. Grins! The colors are fabulous and I think it is perfect without the borders. Its probably "what the quilt needed" not what the pattern called for. I could have enough quilts for 4 seasons, but doggie is on the bed and one or two of them have too much white for me to do that. Of course, they aren't heirlooms, but one I feel pretty particular about that.... We'll see how it goes! I love this quilt....I'll have to look up the pattern.I'm not one to have much in the way of black and white fabrics...maybe I'll have to start gathering! I quite literally LOLed about the borders! Nope, nope, you didn't "forget" them, you made a deliberate (if subconscious) design decision to forego them. Actually, YOU didn't decide, the quilt did. Just like she chose the binding. That's WHY she chose the scrappy, multicolored binding, which would have been lost among the borders. She wanted that thin, delicious bit of color just as we sometimes chose a single, slender necklace when the outfit needs nothing more, nothing less. Beautiful finish! I really like the quilting and having a flannel as the quilt backing is so nice and snuggly. Very very pretty, and what a great chance to try out a new FMQ design. Looks great! A lovely collection of special fabrics (and their meanings). The binding is cheerful and the flannel backing showcases the beautiful quilting. Congratulations on completing your comfy, keepsake quilt. Well done! You did a great job on the quilting. When I machine bind, I sew first to the back of the quilt, pull around to the front and then stitch down from the front. Wow! It's a beautiful quilt. Black and white just bump up the the brightness of green/aqua/tealfabrics so nicely. Congrats on a very stylish finish. My comment from the other day did not appear. So , now I'll try to comment again. Your quilt is beautiful. I love the lime and aqua with the black and white. I think it is just fabulous! I really love both the dancing patterns AND the abundance of different fabrics in this quilt! Truly a wonderful collection of memories stored in the cloth. I can tell it will bring you joy for many years. Did not give the borders a second glance, I thought it was all a design decision on your part. So there. Thanks for linking up with TGIFF. I think it looks great. I'm not a big fan of borders - partly because I've run out of steam by the time I come to the end but also because I think border-less designs have more movement. I love your splash of color. personally I am not keen on borders, either on quilts or between me and Europe, but that's another whole other story. The lime green really is a splash of colour, a great quilt and worth waiting for Sandra. This is absolutely gorgeous! I don’t care for borders, unless there’s lattice, so IMHO, it’s perfect! Fabulous quilt and great story telling! It didn't look like it needed borders before you told us it was supposed to have them... something to play around with for your second one perhaps?! This is gorgeous, and I like it borderless. It also makes me want to branch out from my favorite black and white plus red/pink combo. It does glow! Love your color placement. On behalf of the Finish-A-Long crew, congrats on the finish and thank you for joining in!